A dataset has many characteristics similar to an attribute, thus both Attribute and DataSet are derivatives of AbstractDs. 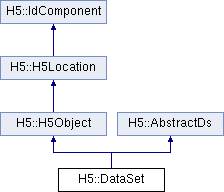 DataSet also inherits from H5Object because a dataset is an HDF5 object. loc - IN: Dataset reference object is in or location of object that the dataset is located within. loc can be DataSet, Group, H5File, or named DataType, that is a datatype that has been named by DataType::commit. Referenced by H5::CompType::CompType(), H5::DataType::copy(), H5::EnumType::EnumType(), H5::FloatType::FloatType(), H5::IntType::IntType(), and H5::StrType::StrType(). chunks.cpp, extend_ds.cpp, readdata.cpp, and writedata.cpp. space - IN: Dataspace for buf. Also contains the selection to iterate over. This function may not work correctly yet - it's still under development. This function reads raw data from this dataset into the buffer buf, converting from file datatype and dataspace to memory datatype mem_type and dataspace mem_space. chunks.cpp, compound.cpp, extend_ds.cpp, readdata.cpp, and writedata.cpp. References H5::PropList::getId(), H5::DataSpace::getId(), and H5::DataType::getId(). This function writes raw data from an application buffer buf to a dataset, converting from memory datatype mem_type and dataspace mem_space to file datatype and dataspace. compound.cpp, create.cpp, extend_ds.cpp, and writedata.cpp.